This discounts page is where you can create discounts for your customer and for your staff discounts (if any). Firstly, click the blue “Add Discount” button located on the top right of the page, highlighted in orange in the picture below. Once you click on the button, a new page will appear. Here, fill in all the necessary details of the discount that you intend to create in the system. The discount code is the code that the customer will use at step 6 of the reservation process. Click on the blue “Save” button, highlighted in orange in the picture below, to save the discount once you are done. How to delete a discount? You can delete the discount by first clicking on the particular discount and then click on the red “Delete” button located on the top right of the page, highlighted in orange in the picture below. To learn more about discounts and charges, follow this link here. How to hide a discount? You can make discounts for your customers which will require them to enter a code or you can give a manual discount to your regular customers. This, however, will completely disable to discount module. 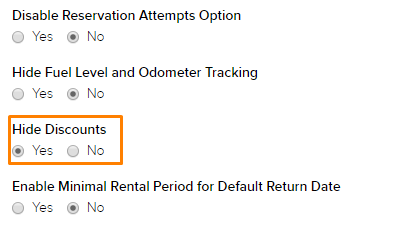 Here, select “Yes” under “Hide Discounts” as shown in the picture below highlighted in orange. Now when you reach Step 3(Extras) in the reservation process you will notice the difference as shown in the pictures below. The picture above shows the discount module highlighted in orange. That is when the “Hide Discount” setting is set to “No”. When the setting is set to “Yes”, it will appear as such in the picture below. Besides the main items, Brand, Name, Discount Type, Discount, Coupon Code, there are 12 other settings that you should take note of when creating a discount. These are, “Active?”, “Visible for Direct Booker?”, “Is Manual Discount?”, “Is Discount from TO Commission”, “Allowed Vehicle Classes”, “Disable Re-use”, “Available From”, “Available Until”, “Days to apply this discount”, “Top days to apply this discount”, and “Skip Automatic Application Based on Days”. This is the main setting to tell the system that this discount is valid and can be used. 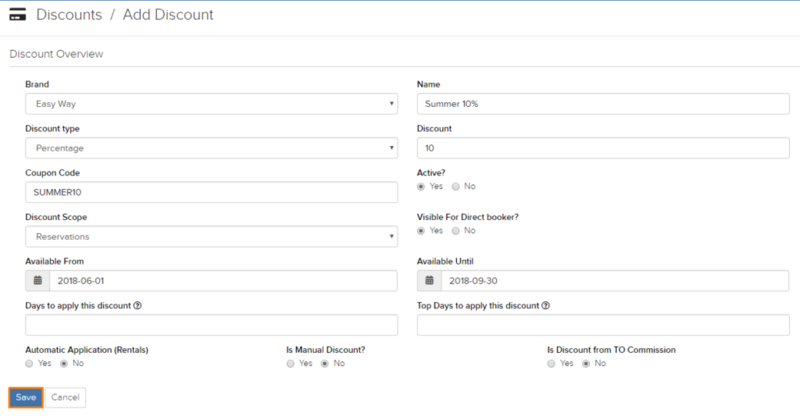 This setting will allow this discount to be applied for bookings made directly. This setting will separate this discount from the TO (Tour Operator) Commission. 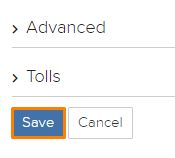 This setting will set the vehicle classes that you allow this discount to be applied to. This setting will not let returning customers reuse this discount. This setting will only allow this discount to be applied starting from this date. This setting will only allow this discount to be applied before this date. This setting will apply this discount to a reservation after the minimum amount of days stated in this field. This setting will only allow this discount to be applied a maximum of days. This setting will either allow or disallow this discount to be applied automatically based on the days set. 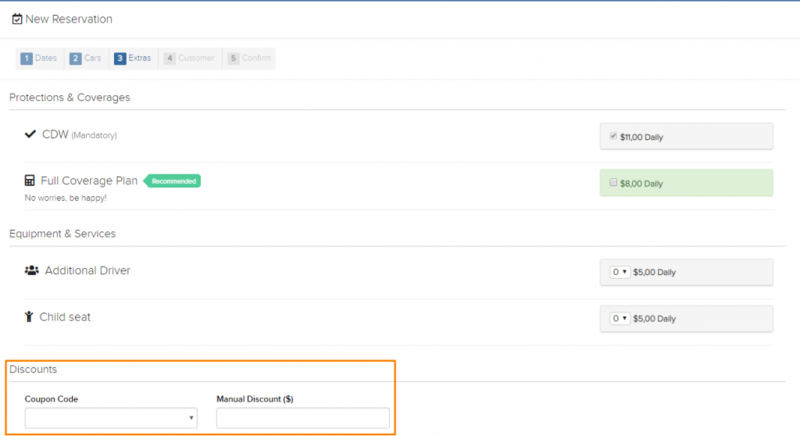 To learn how to apply a discount automatically to a particular customer. Click on this link here.